DeSantis orders speed-up of money to clean Hurricane Michael’s mess | Insurance Litigation Group, P.A. Gov. Ron DeSantis directed the state of Division of Emergency Management to speed up sending money to Panhandle communities being swamped financially by “massive” amounts of debris from Hurricane Michael. DeSantis also said that in addition to up-fronting disaster relief money to local governments, he will push the White House to increase federal reimbursements for debris clean up. 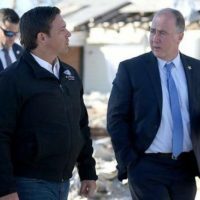 Long also said he doesn’t expect Michael’s recovery to require a request for additional emergency funding from Congress or that the response for Michael will be affected by the federal shutdown, which has halted paperwork for people seeking reimbursements from 2017’s Hurricane Irma. State officials have estimated the Oct.10 hurricane created about 20 million cubic tons of debris, as the Category 4 storm barreled a path from Mexico Beach into Georgia. Much of the debris is still strewn across the region. DeSantis said he’s seen progress in the clean-up and that quicker the debris is cleared, other steps in the recovery will follow, such as reopening business and being able to welcome tourists. For the full article, please visit The Orlando Sentinel.